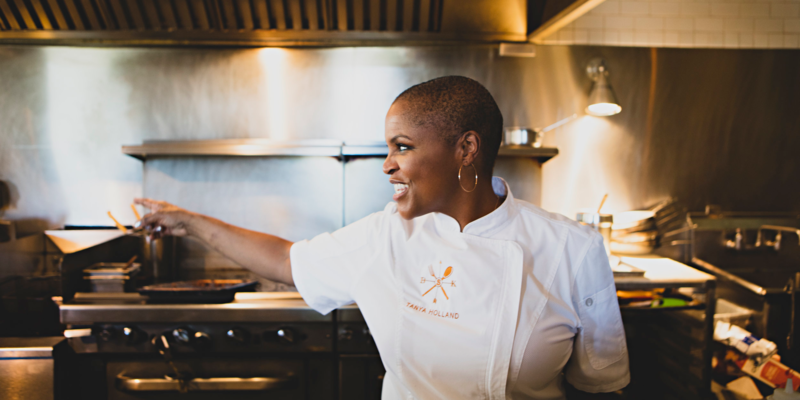 Award winning chef, author and restaurateur Tanya Holland will come to Haas to discuss her journey in the food and culinary world, featuring a tasting of her favorite recipes. Known for her inventive take on modern soul food, as well as comfort classics, Tanya Holland is the executive chef/owner of Brown Sugar Kitchen. She is also the author of the Brown Sugar Kitchen Cookbook and New Soul Cooking; was the host and soul food expert on the television series Melting Pot; and competed on the fifteenth season of Top Chef. Holland holds a Bachelor’s degree from the University of Virginia, and a Grande Diplôme from La Varenne Ecole de Cuisine. Refunds will not be granted after April 19 unless there are individuals on the waitlist.